Onion – 2 – chopped finely. 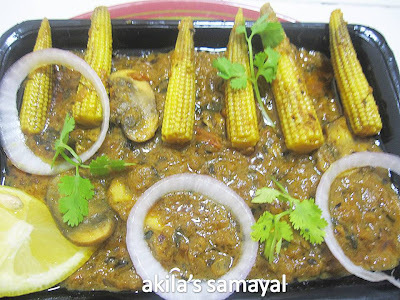 Take 2 tsp of finely chopped onion and keep aside and grind the remaining portion of onion to a fine paste. In a pan, add ghee and fry the babycorns first for 5 min and keep aside. Add mushrooms and just fry for 2 min and keep aside. Now in the same pan, add the oil and add the spieces. When they start spluttering, add the chopped onion and fry till they become translucent. Now add the onion paste and fry till the raw smell goes off. Add the tomato paste and ginger garlic paste and cook for 5 min. By this time, the gravy would be very thick. Add the milk now ( u can add water also) and allow to cook for another 5 more min. Now the oil will start coming out slowly. At this time add the lemon juice and mix well and cook for just another 3 more min. 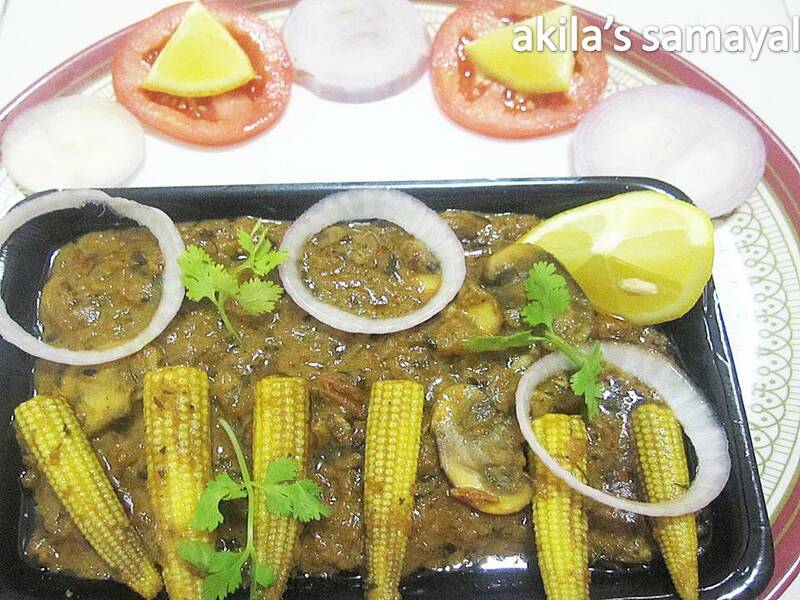 Transfer it to serving place and garnish with coriander leaves, tomato, onion and lemon. 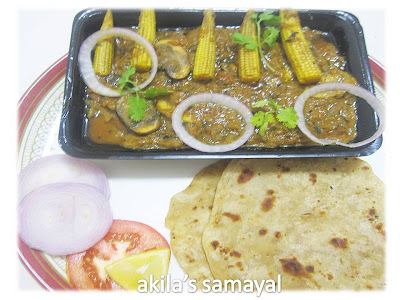 Serve with chappathi, roti or naan. 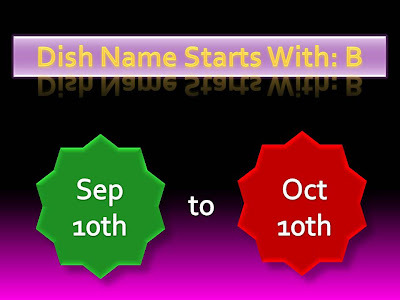 Post your Recipe – whose name starts with letter B between Sep 10th to Oct 10th 2010 with a link to this Event. Old posts can also be reposted with a link to this Event. A grace period of 5 more days is given - till 15th October. Adding the logo is appreciated. Non bloggers send me mail with a photo of your recipe. Roundup will be posted in October Mid. I believe my lovely fellow bloggers give support and encouragement as my previous events in form of entries to make the event a big success. Please feel free to leave your comments and looking forward for your wonderful recipes. Best Wishes for your 100th post..!! 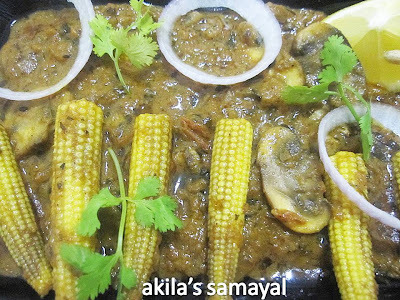 Congrats Akila.. 100th is definitely a milestone..
such a treat.. is this dish also..
let me dig my archives..
Congrats on ur 100th post.. the baby corn n mushroom looks delicious..
nice recipe...hv been wondering what to do with these baby corns ....good one..
congrats on 100th post! !will participate in the event! !count me in! !You have not visited my blog dear!! Good round-up. Baby corn dish looks yum. Congrats and many happy dishes from you and many happy dishes to you from all your blog friends! Congrats Akila for ur 100th post, keep rocking...This babycorn & mushroom masala sounds very delicious and yummy..Happy hosting..
Congrats dear on your 100th post...beautifully presented dish..so inviting. Congrats on reaching your 100th post. 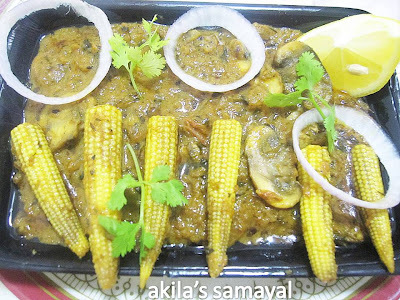 Mushroom Masala looks so good..I'm surely in for the event. 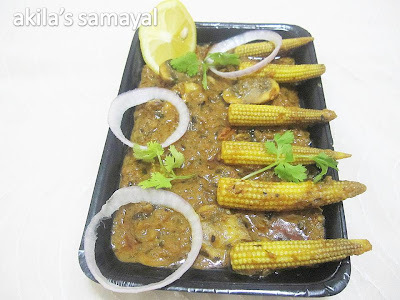 babycorns look lovely in the sauce! 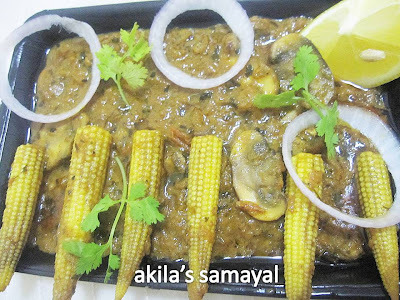 Dish looks spicy and mouthwatering, Akila. Keep rocking. Will send my entries. Thanks for hosting. Congrats on your 100th post! 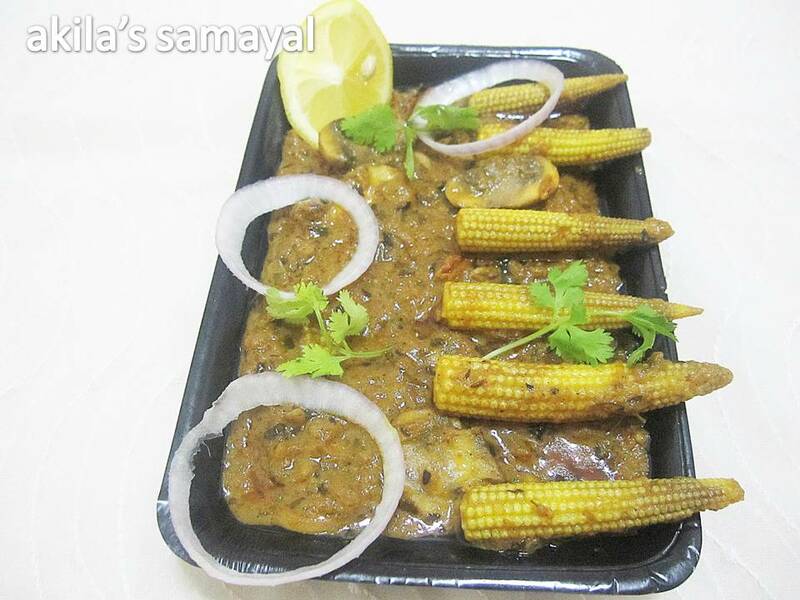 Babycorn masala looks mouthwatering! Congrats akila..anything with baby corn..just love it..looks tempting. Sent you my first entry. First time here,interesting event...will try to participate.Do visit my blog if time permits. ஈவண்ட் க்கு ரெசிபி முடிந்தால் நானும் அனுப்புகிறேன்.